Newspaper Rock: North Dakotans vote to retire "Fighting Sioux"
By Chuck HagaNorth Dakotans signaled Tuesday they’re ready to say goodbye to UND’s Fighting Sioux nickname, overwhelmingly favoring a ballot measure that would allow the university to drop the name. With 84 percent of precincts reporting, the “Yes” vote on Measure 4 was leading the “No” vote by 67.64 percent to 32.36 percent. The “Yes” votes totaled 90,216, the “No” votes 43,151. With all 27 precincts reporting in Grand Forks County, “Yes” had 5,426 votes to 2,276 for “No,” or 70.45 percent to 29.55 percent. The “Yes” vote carried by decisive margins in the state’s major counties—and carried Sioux County, home of the Standing Rock Sioux Nation, by 184 votes to 159. 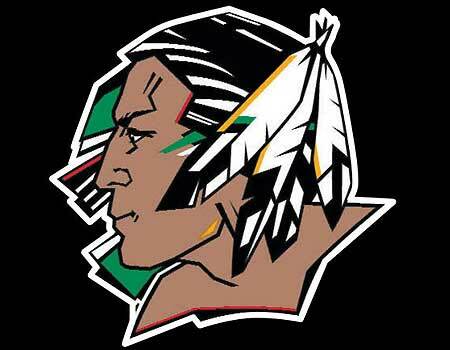 “Obviously, we’re disappointed,” said Sean Johnson, Bismarck, spokesman for the group that sought the referendum on the nickname.Comment: For more on the Fighting Sioux, see NCAA Punishes UND for "Fighting Sioux" and UND Foes Chant "Smallpox Blankets!"